MANILA — The lawyer of expelled Iglesia ni Cristo (INC) siblings Angel Manalo and Lottie Manalo-Hemedez ended up in the hospital on Tuesday night after security personnel and men in masks reportedly assaulted her and two other companions when they responded to a call for help of her clients at their 36 Tandang Sora home in Quezon City. Lawyer Trixie Angeles said she got a call from her clients on Tuesday night, saying that security personnel and masked men were trying to enter their residence to serve a summon. What is happening in #36? Napadaan ako and you OWE followers are causing traffic. Need to park my car para lang makuhanan mga kabalbalan nyo.. Di talaga kayo titigil!!!! 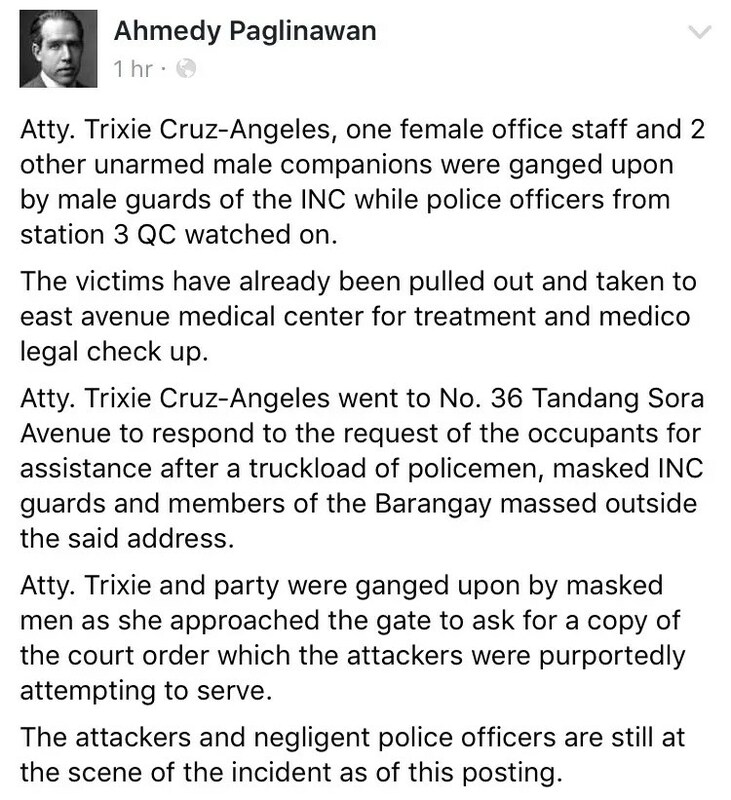 Fellow defenders, winasak na po nila ang isa sa mga gates ng #36 and they are allowing masked men to go inside. #36 T Sora Updates U R G E N T!!! Lives are at stake!! CALLING PRES. DUTERTE: PLEASE HELP STOP THESE ATROCITIES AND HUMAN RIGHTS VIOLATIONS! KA EDUARDO: WHY DO YOU ALLOW THESE TO HAPPEN TO YOUR HELPLESS SIBLINGS, NIECES, NEPHEWS?? ?HOW CAN YOU??? Unidentified men with high powered guns and faces covered with masks aggressively trespassed 36 TSora by using a backhoe to tear down the front gate and barricaded 36TSora. These men were able to get inside, took away all cellphones with video recording capabilities. They used a sheriff to try take out all the remaining vehicles of the family of the late Bro. Eraño G. Manalo. Reports have it that Atty Trixie was hurt. As of this moment, the residents of 36TSora cannot be contacted. The place is too dark to even take photos. We need Media People’s help to show the world the atrocities of these evil people. Dear brethren, we are begging you all to please contact Media and kneel down with your families and pray!! You can never silence us! We will let the whole world know how RUTHLESS you are! You, said to be ministers of God (?) deceiving people by citing verses in the bible, twisting and forcibly fitting-in God’s doctrines in order to justify your evil doings, hiding your wickedness under the the sacred name of Christ. What you have done will never be forgotten in the generations to come. Saklolohan po natin ang pamilya ng ka Erdy. Hindi naiintindihan ng iba ang ating ipinaglalaban para sa INC. Ang pamilya ng ka Erdy ang kapakanan ng Iglesia dahil sa kanila ibinigay ang bilin kung si evm ay mag fail. SOBRANG SOBRA NA ANG FAILURE NI EVM. Saklolohan po natin ang nasa 36TS para sa kapakanan ng INC.
Yan..po isa sa mga ksama nanim na binasag ang salamamin ng kaya sasakyan hindi umano hindi kilala nka motor nka bonet napinagpapalo ang sakyan..
Ang 36TS cmpd po ay under seige ng mga goons ng INC.
FYI po, wala raw tulong na darating ngayon mula sa Malacanang. Tayo daw mga defenders ang unang dapat na manindigan at humarap sa kasamaan ng pamamahala ng INC. Tayo daw po ang unang dapat na kumilos at kapag nakatatawag pansin na ang ating pagkilos, saka lamang sila papasok. Sa mga tunay na defenders, ang kapakanan ng Iglesia ay nasa pamilya ng ka Erdy sapagkat mayroong bukod na bilin ang ka Erdy sa kanila sa kapakanan ng INC kung hindi gagawin ni EVM ang bilin sa kaniya. Nakita natin ang tahasang pagsuway ni EVM sa bilin sa kaniya ng ka Erdy. Ito ang dahilan kaya nila ginagawa ngayon ang nasasaksihan nating pang aapi sa kanila at panggigipit. Kaya mahalaga po na mailigtas natin ang pamilya ng ka Erdy sa kapakanan ng INC.
Halina kayo mga kapatid opaglaban natin ang ating kahalalan. Grabee na po lahat ng construction worker pinakalat na sa kalye ang dami na may ambulance ng nakastandby outside, labas pasok na mga tao, at pulis..all channels there ang pulis ano na po ba dapat gawin? Ang hirap di mo alam gagawin. Madaming mga minions ang pinakalat nila sa kalye habang pinasok ang bahay ng ka angel at pinaligiran sila sa isang kwarto ng mga armadong lalake puro de armalite. Binugbog si atty. trixie at mga marines na security sa loob ng 36TS. hinakot mga sasakyan nila ka angel. INC POWER…that’s what we need NOW. Don’t expect Duterte to even lift a finger to mediate because INC (EVM alone) endorsed him. Upon learning of INC’s endorsement, I recall Duterte telling the reporters: “Salamat naman, Hindi kayo magsisisi. You will not regret it”. And that’s exactly what’s happening right now. Hindi makikialam si Duterte. He could ignore the Catholic Church and Pastor Quiboloy but not EVM dahil pareho silang mga maton. Parehing halang ang bituka. Even the media is quiet. ABS-CBN through its Bandila program mentioned the incident briefly but that’s all. Even the giant network is now controlled by EVM with popular talents like Anthony Taberna as his point man. The only way I see is for the international media to come in. We cannot expect anything from local media since most are scared of INC. Protest rallies must be held abroad starting in the US. So far, this is the only solution I could think of. EVM is now behaving like the big bully China controlling the South China Sea. I never wish harm on anyone much more death; but this time, I pray to our Almighty God to end all these by taking EVM’s life NOW. I may have to agree with you. Because of this “utang na loob” BS by Duterte to the INC vote, he will ignore the atrocities in #36 Tandang Sora. If, somehow, Duterte investigates #36 Tandang Sora again, what will happen? Will we see another EDSA nonsense again? “Separation of church and state” my a$$! President Duterte, if you are really serving the interest of the people of the Philippines, please have some time to know what is happening to the INC right now. Those people in #36 are also Filipinos. Thanks. Unfortunately, Duterte is more afraid of EVM than his long time buddy Pastor Quiboloy. At least GMA News finally broke the silence by interviewing Trixie. I know Aksyon 5 and UNTV have been broadcasting once in awhile. I believe that ABS-CBN has been paid off. NIce timing. while we are preparing for the mid year pasalamat. Talagang sobrang pinagdimlan na sila at hindi na nila alam ang kanilang ginagawa. What is the urgency to do this now. It cannot wait next week? I can’t help but observe that since last year, the sanggunian will do something before a milestone with the church is going to occur. Parang sinasadya to spite us all. This now crosses the line because outside civilians have been attacked. The Philippine government does not even protect the rights of its citizens. Amnesty International will intervene when the government does not act in human rights issues. condec@hrw.org is the point of contact. Whoever is nearby should contact them also. Time has come for people to realize how bad and powerful INC is under the leadership of EVILM. Unless thousands of members and non-members are killed, no local and international organizations would bother to look into this. First, INC like other religious groups would invoke the separation between church and state. Second, INC has grown so huge and powerful that even foreign countries have taken notice. Amnesty International? It’s US-CIA group disguised as international human rights organization. Amnesty won’t bother unless it’s interest meaning America’s or Western’s interest is at stake. At home, we have the Human Rights Commission but if it cannot even succeed in dealing with Duterte, what more INC? We encourage all in the INC who are witnessing this atrocity and also the INC Members who remain silent because they feel helpless but agree what EVM and Sangunnian are behaving is wrong. I ask all to cut the power source, the blood that gives life to the evil present INC Leadership. Its the Abuloy or offering. In the beginning, we Defenders avoided asking all to not give offering because it was for God, But now that the INC has been apostatized and no longer the true church, it is now ok with God if you do not offer to EVM and Sangunnian, do not give the offerings to them anymore since the INC is not INC anymore. I encourage all INC Members who feel EVM is not the true leader or posessed by Satan to please give only small offering or just a Piso Centavos for their offering this Thanksgiving, so we can prove to EVM that many are silent but refuse to give power to the bloodline or powersource aka Offerings. Any religious organization will not survive without monetary offerings. Trust me on this. Cut the flow of offerings, EVM and Sangunnian will not have the power or resources to harm Ka Erdy’s Family. No more paid INC Security, No more contruction workers, no more high paid hitman to do its dirty work. Cut the offering, cut the blood that gives life to the corrupt EVM. Your message is as strong if not stronger than some readers like me here. I dare not call EVM “Satan” but you do. On the other hand, what if indeed EVM is the Devil disguised as the current Executive Minister? Remember Satan is the most deceitful and he can act like God or Christ. Question: How do we get rid of this Satan EVM disguised as Executive Minister. Suggesting to cut down or cut off offerings is not the solution. Most fanatics would still give believing that it’s for the church and God. INC has become so rich today that a decline in offerings doesn’t hurt at least for now. If many are being expelled or leaving the church, so are many being missionized and converted. Take note how frequent the evangelical missions these days. EVangelical MIssion disguised as LIngap Para sa Mamamayan. It’s no different from a company that sells products. To counter the drop in sales, the company must come up with better marketing strategies and promotion. 35% ng mga local sa aming distrito ay urong sa Pasalamat ng PNK. Pinatayo ng O1 ang mga destinado ng mga local na ito sa klase nila nung Lunes at required silang magsalaysay at magpaliwanag kay Jun Santos kung bakit umurong ang mga local nila. So sa tingin ko, may impact na rin at marami nang mga kapatid ang gising bagaman tahimik lang. Saka, how come 2 years na ang billion-peso loans ng INC sa mga bangko pero hindi nababawasan ang principal, kundi interes lang ang nababayaran. Kaya sa palagay ko, depleted na talaga ang naipon ng INC sa panahon ng pamamahala ng Ka Erdy. Tapos sa darating na Pasalamat ngayong July 23/24, mas lalong uurong ang handog dahil sa mga pangyayaring sa 36TS. Oo, meron pa ring maghahandog pero naniniwala akong hindi na ito makasasapat sa pangangailangan ng INC, much more, sa pagbabayad ng bilyong utan. Tama hindi naman siguro mararamdaman ng owe church kung IILAN lang ang titigil sa paghahandog..
Malamang wala sa handugan ang solusyon para matigil ang ginagawa ni EvilMan. Cguro marami nga ang hindi sang ayon sa ginagawa ng Owe leaders.. Pero ang lahat halos ay takot lumaban dahil sa ibat ibang kadahilanan kaya màlamang ay hindi lumantad ang “maraming” tutol at dismayado. Kaya di ito ang magiging solusyon dahil sa takot ang marami. Sa ngayon ang naiisip ko lang na solusyon ay kung ipapaliwanag ng mga nasa ts36 kung bakit ayaw nila lisanin ang kanilang bahay. Bahay lang ba talaga ang pinaglalaban nila.. O may binilin talaga sa kanila ang ka EGM. Ano kaya iyon? Sana mabigyang linaw nila ito. Kung ang ka tenny at ka marc nga db umalis dun sa ts36.. Bakit sila e hindi umalis dun.. For sure maraming mga defenders ang kukupkop sa kanila. Anong meron sa ts36? May bilin ba talaga ang ka EGM? Kung meron – ano pa ang inaantay nila para ipahayag ito sa iglesia? Iniintay ba nila ang ika pitong taong pagkamatay ni ka EGM? August 31 2016? O ang ika pitong taon ni EVM sept 7 2016? yung mga nanakit nayun ay kakilala din ng mga Manalo..
Hindi kaya isa sa mga naka-maskarang nanakit ay si Ka Angelo na anak ni EVM? INC is the biggest cult in the PH. It makes ruben ecleo very ashamed of himself. BTW, how much is Duterte’s lead over roxas? How many are INC votes? Duterte should not be needing INC’s backup because he will still win without INC’s votes. Just look at his lead over Mar last elections and even if you remove the INC votes on Duterte, he will still massively lead Mar. Siyempre alam nating lahat na ang P.Diyos ang makatutulong sa ating lahat.. Pero walang ibang makatutulong sa mga nasa ts36 kung hindi walang iba kundi ang Kanilang Sarili din. Matutulungan sila ng defenders sa pagkain,iba pang pangangailangan pero pansamatala o pansamantagal man ito. HINDI NITO MAWAWAKASAN ANG TALAGANG PROBLEMA. I hope it makes sense.. Yan naman ay batay lang da aking sariling pananaw sa mga nangyayari. Kaya sana ilahad na ang Buong Katotohanan para sa Iglesia.